2. A studio portrait of the donor's grandmother, Ytke. 3. Bertha Magid and her cousin stand on a street corner in Bialystok. 4. Bobl Melamdowicz (sister of Icchok) and friend. Bobl was burned to death with others in a synagogue in Bialystok, June 27, 1941. 5. Close-up portrait of Joseph and Chaya Grochowska in their home shortly before the start of World War II. 6. Ewa Krakowska walks down a street in Bialystok with her uncle, his fiancee and her brother. 7. Exterior view of the synagogue in Bialystok. 9. German and Soviet military officers sign the agreement by which Poland is partitioned between Germany and the Soviet Union. 12. Lova Grochowska poses in her home shortly before the start of World War II. 13. Members of the Shlachter family outside their home in Dabrowa Bialostocka. 15. Portrait of Chaya Growoska and a friend in Bialystok. 16. Portrait of the two children of Aaron Shmuel Shlachter. Both were killed in Treblinka. 19. Students from the Bialystok Yiddish school raking in a yard. 20. 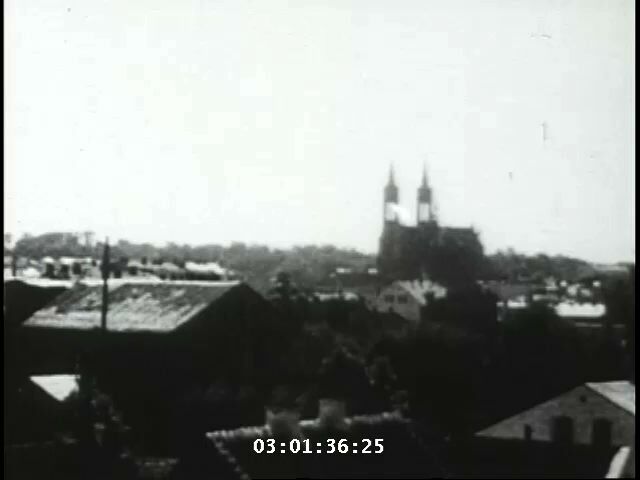 View of a street with wooden houses in prewar Bialystok.